We could not see our opposite in the old smoking kitchen. To interview the old, wise man of the town the wood fired stove had to give its best. Someone could see the story of the old man in his face in every detail. He told us about the valley and its development. First there only have been two bridges in the valley. Now there is a street all along the 38 Kilometres of the whole valley. Tourists come to visit the fascinating nature and mountains, which rise up to 6000 m left and right of the valley. The valley itself is around 3500 m high and Tibetan people settled into this inhospitable place. This people live their life in a very easy and pure form together with free running sheep, cows, Yaks, pigs and many other animals. An unreal, friendly mute lies over the whole valley, where larch trees grow up to 4000m. The oldest of the valley talked about a warm welcome and was pleased to meet us, who travelled that far the come to his place. Ice-climbing he found cool and was wishing us the best for our undertakings. We should all be like one family. With tears in my eyes I went looking back to his opened minded and incredibly friendly philosophy of life. After our arrival in the megacity Chengdu at an outside temperature of +19°C I lost my hope to find some ice. But with every kilometre closer to the highland northwest of Chengdu it got colder and the air thinner. Already at our arrival in the Shuangqiao valley we could see some ice lines above the street. But first of all we had the fight hard with the extreme altitude, jetlag and this unusual food all the time. The performance of our bodies has been reduced to a minimum. At the inspection of the valley, which can be done very easy by taxi, we got completely exited realising so many ice lines all the way through the valley. Locals say that you might find more than 100 ice streams. 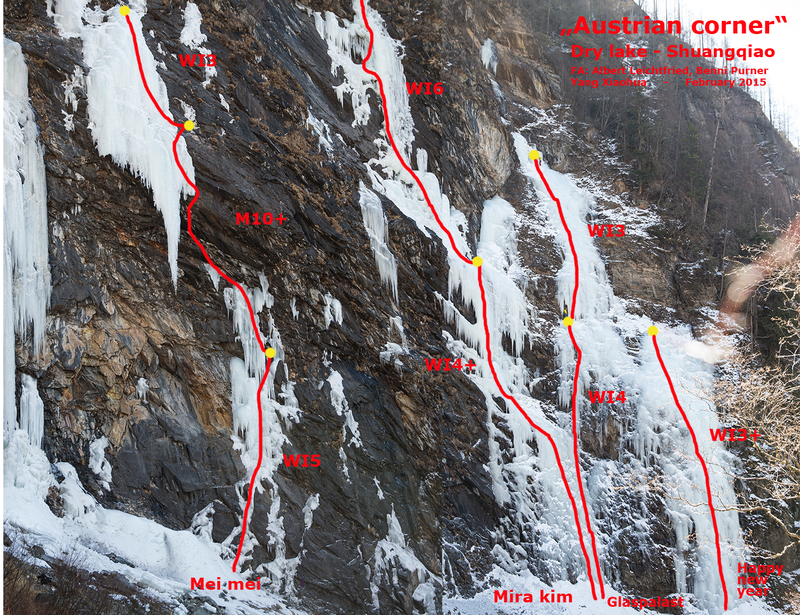 And there is one big bonus on this – because of the road you never walk more than 10-60 minutes to the base of the routes and in the valley the snow amount is mostly 0-5 cm – we have been landed in the ice climbing paradise! Because of the altitude we had to start slowly. Already after some steps from ground to first floor, we had been exhausted. Day by day approaching the ice got easier and we could focus on harder climbing. We did some amazing ice lines, the variety is huge, so it is mostly hard to choose a goal. At dry lake we left our marks and opened a new sector called “Austrian corner”. With “Mira kim” WI6 and “Mei mei” (little girl) M10+ we could climb two real highlights in the valley. “Mei mei” could be the hardest mixed line at this altitude of 3850 m. This really challenging and outstanding three pitch route took everything out of me to get the redpoint done. Now I look back to an amazing and very inspiring time in Tibet with many incredibly moments on ice and even more incredible moments with people who had taken us into their family.